SandBank @ Parkland Green | Is Life a Recipe? SandBank @ Parkland Green, what a place. We used to go to this location when it was Artz Pizza. Undoubtably the best pizza in Singapore in my reckoning. But then the rent went up and he left for India. We were there at least once a week. Do you remember it? Also where the driving range was and the Chinese sea food restaurant. Backing on to beach, a sort of tiki like restaurant? Well now it is SandBank @ Parkland Green. Parkland Green is a really funky gathering of new bars and restaurants, directly opposite the Parkway Parade underpass. We have eaten dinner and breakfast there. Heck Mary and I even had our wedding reception there. Yep it is cool for school!!! Here she is. We sat outside where the two lads are sitting and yep those stairs to the right do indeed go up to the pool. On our first trip we had a so so Mexican for lunch @ Parkland Green (apart from the chile con carne that was first rate!) and then ended up staying due to bad weather and went for dinner at SandBank @ Parkland Green. You have to try this place it is good. There is even a swimming pool contained within the bar. NICE!!! 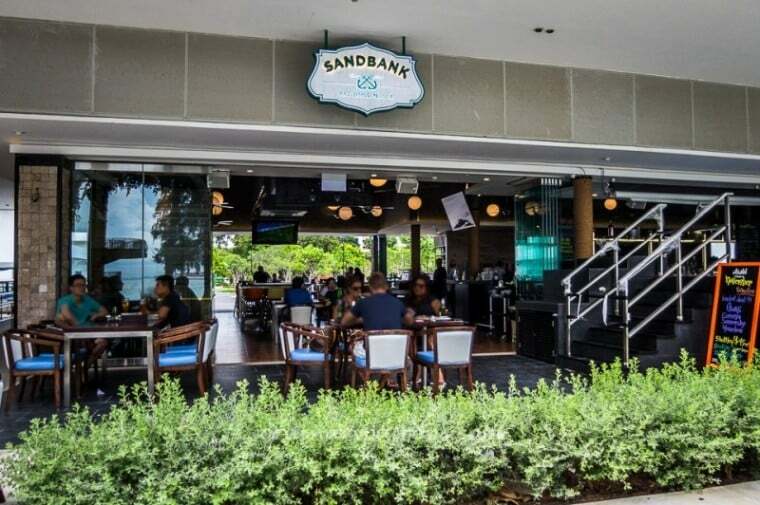 The logo at SandBank @ Parkland Green states “Eat, Drink, Plunge”. I like that, I like that a lot! My kind of gig this place seems! When I first got there all I could see was fried food, so my head was thinking sh*t if this is all they have I’ll be disappointed. Just fried everything, but then we got the menu and wey hey there was a seriously impressive range of fusion food. So it was an, OK decision made let’s stay and avoid the rain and have dinner. We were so glad we did as the food was truly good. Whilst sitting there out comes the manager – “I know you”, says he. He used to be the manager at Mana Mana – so yes indeed he does know us. Really great guy. 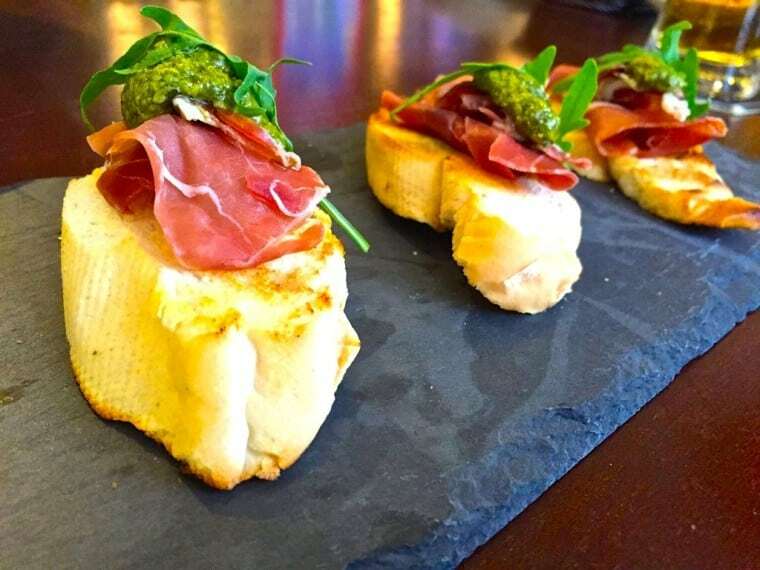 One of my starters was Parma Ham Bruschetta with green pesto. I sprinkled a little parmesan for more cheese kick, and these delicious little things were consumed in seconds. Amy went for the fish and chips. 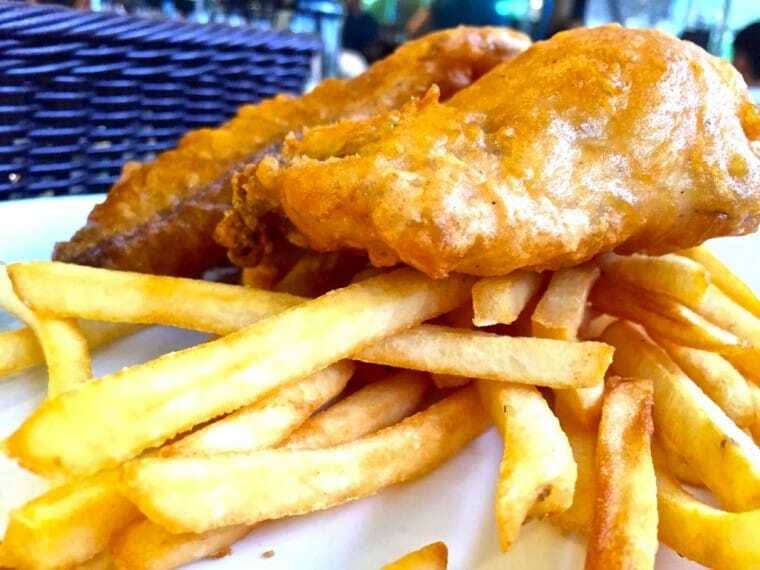 Not too fishy, with a perfect batter and a really nice dipping sauce that she ignored so I had it ha ha! I really liked this – which is a big call out for a non-fishy! Ollie went for pizza – yum oh yum, this is almost living up to Artz. 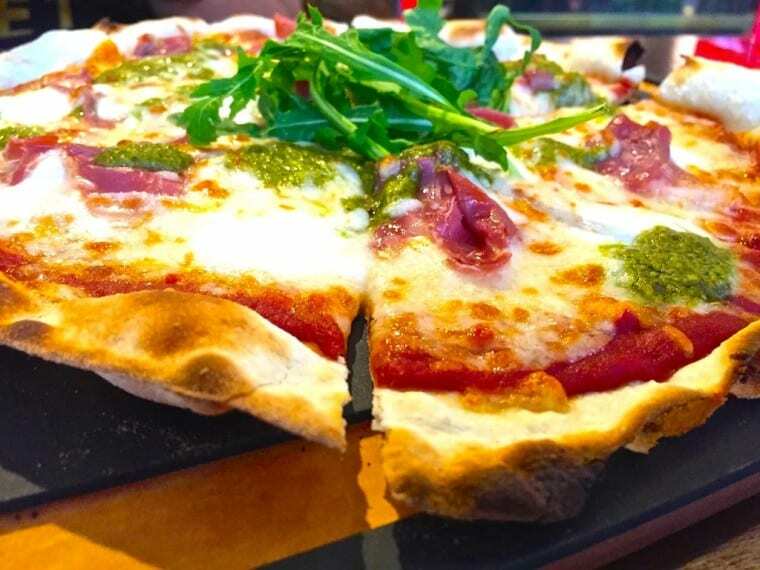 This was a parma ham margarita pizza. Damned good pizza guys. Two more for me now. Mini sliders. 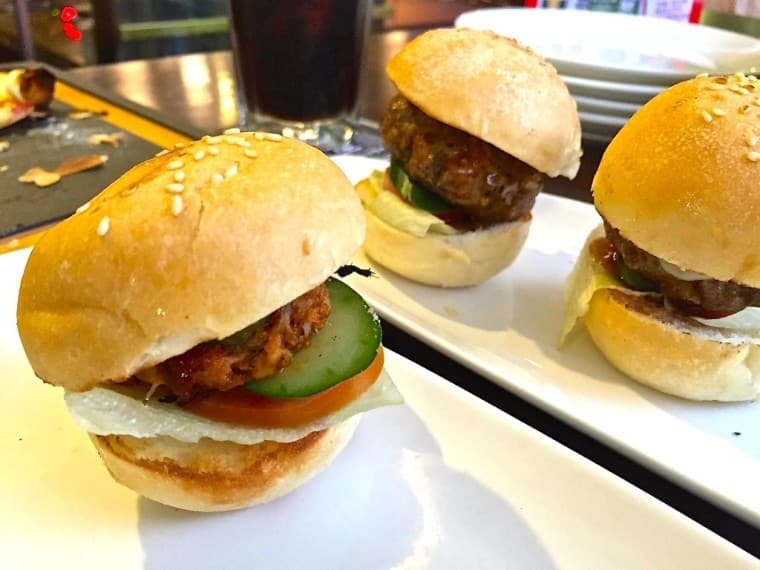 Each dish comes with three mini sliders of your choice. I had pulled pork which was awesome and a so so beef burger. Both were really nice, but the pulled pork edged ahead easily in the taste race. Very nice. 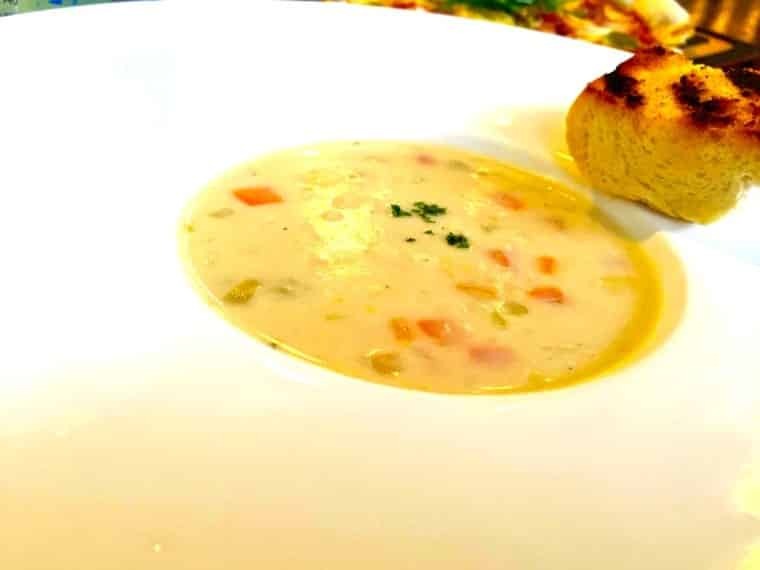 Mary’s option was (no surprises here), SeaFood Chowder. Now yours truly did not try this, but Mary confirmed it was very very delicious. So well done again Singapore – a great new development in Parkland Green. We opted for SandBank @ Parkland Green. It was ideal for kids and families as you are right on the beach, facilities are great, the view is wonderful and the food was just bloody good – and to top it all at reasonable prices. Add the swimming pool and you are rocking. We have now been like 5 times. SandBank @ Parkland Green, is one of those. You have to go have a look folks, its quality – ENJOY!!! No Replies to "SandBank @ Parkland Green"